At the surface, it may look as though this has nothing to do with growing tomato, cucumber, beetroot etc. but there is a very strong connection between record keeping and a successful farming engagement even if the latter is not tailored toward profit making. I have often received calls from people wanting to make inquiries about particular veggies and during our conversations, I do ask; “oh which variety was that watermelon you planted last season that you are talking about?”…”I don’t know”, “I can’t recollect”, “I lost the seed’s packs” etc. Whoa! 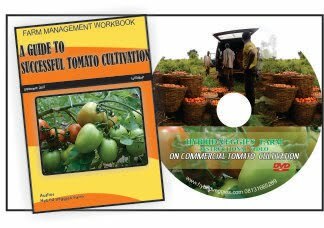 I do wonder in my mind how can a gardener/farmer grow in knowledge without this. could be seen as your compass. Financial record: This is a record meant to track all your financial transaction. It is the foundation of knowing your return on investment ROI. It is all encompassing and could even include sales record. You buy seeds, fertilizer, pesticide, organic products, pay carpenter, get paid for this and that etc. You may require the service of a pro to design one for you perhaps. Equipment/Store record: This is a record use to list all the equipment on your farm. If it is a big commercial farm, you may want to keep tab on who is collecting this and that, who return this and that. This is not necessary for a small farm. Staff record: This takes care of the names, the qualification, profile, the department of each of your worker. It may also take care of their responsibilities. This can be used by consultants for Training needs Analysis TNA, by financial institutions etc. Salary record: Of cause, you want to know how much you have paid all your workers in total every month, who has collected salary advance, how many ad-hoc workers you employ for that month and how much you have paid them, the bonus, the overtime etc. Sales record: This is very essential in that this is the only record which shows that you are getting reward for all your production activities. You want to be able to analyze in the process of time if product A is more profitable than B, which crop you should focus on, the market trend, the time of the year that sales peak the most etc. Production record: Production record is the core of your farming biz, the lubricant, the pivot. This record takes into account what you plant (variety/quantity), what you spray, when you spray, for what pest, which fertilizer you applied and quantity, when you harvest, quantity realized etc. Tax record: You know what this means of cause. You also have harvest record, pack house record, storage record etc. Do you actually need all these? 1. Simple production record: This is very essential as you may want to keep tab on what is done daily on the field not necessary who done it. This kind of record should be crop specific. You may have different portion in your note (book) to keep record of different crops. 2. 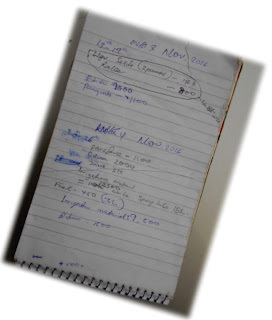 Simple expenses/income record: You could just use your diary specifically for this purpose. Each day, you are expected to record expenses that you make, for what and also income from sales of farm produce. 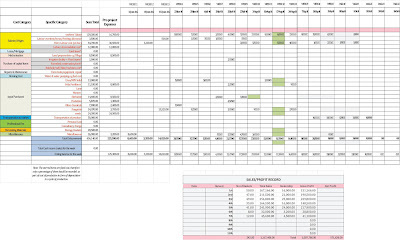 However, unlike the Simple production record, you would then need to enter this record probably on a weekly basis into formularized excel spread sheet (available on request) which would help you summary the data and give you a concise information on how well you are doing thus far. What percentage of the total expenditure you have spent on seeds, labour, ad-hoc staffs, fertilizer etc. can be seen at a glance. 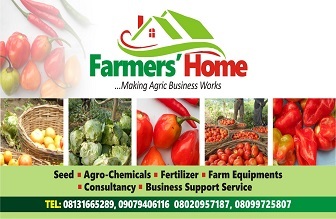 If you have not been doing this, then you haven’t start looking at your farming activities from business angle. The benefits of this record keeping outweigh the cost and/or stress of getting one. This would underline the financial status of your farming endeavor at any point in time as it would help you in planning for another season. I hope you find this helpful in a way. 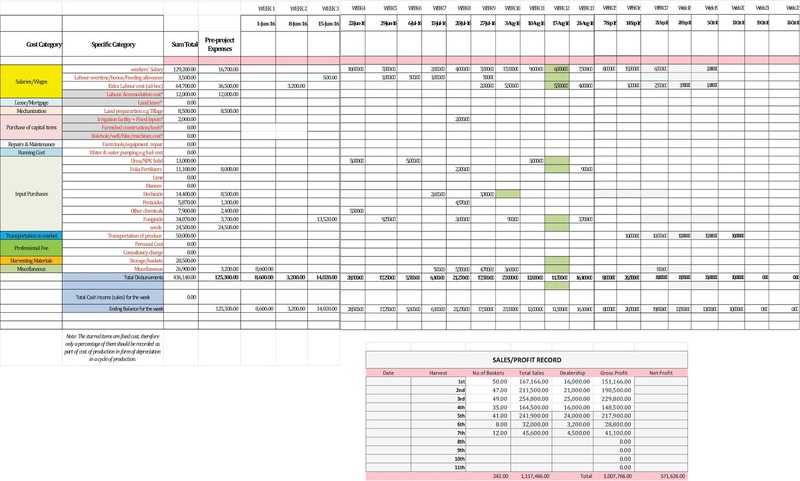 You may want to contact me for a detailed financial record template and also financial spread sheet. Please send mail to hybridveggies@gmail.com with the subject “Financial record”.